i designed this card for the spring scrappy hours challenge, coming april 1st. i hardly ever use a plain white card, but i thought it made all these pastelle colors stand out more, they look really fresh and crisp. got a wad of the purple metallic honeycomb ribbon from my pal daniela's store, she sells great supplies. the cupcakes are coming, the cupcakes are coming! they were a bit delayed in manufacturing, but they will be arriving at c&t in another week or two. but lucky me, i get to play with one of the prototypes...and i just had to turn it upside down! click here to see more designers' cuteness with this fabulous board book. who knew that the wax from a bee's hive would become such a marvelous art material? my fabulous friend daniela costa taught a beeswax collage class in her home today. a dozen women filled her living room, all tucked comfortably at a long table, amidst countless bowls, plates and baskets filled with baubles, ribbons, buttons, charms, papers and assorted vintage ephemera. we each started with a thin 6"x18" board. we painted and papered a background grid, and coated it with hot beeswax to get this wonderful gloss and texture. then we all collaged away...and we barely made a dent in all the yummy stuff daniela laid out for us to work with. but we managed to totally blow out the craft iron that you use to even out the wax after applying...it was quite the spark! we ate lots of chocolate, drank iced tea and got to know each other a little better...it was a very inspirational and creative afternoon. oh and there were door prizes too! and it's brie from illinois...she is the winner of this week's blog follower drawing. brie is an art teacher who makes lovely scarves and journals. she'll be getting this little beauty of a card right here...i used a cool vintagey rub-on from royal & langnickel, an art supplies manufacturer. i just love copper and burgundy together. congrats to brie, and thanks to all of you for following my blog—my next drawing is april 5th. i had the opportunity to make these props for a page on the c&t website. if you or someone you know is planning a diy wedding (do it yourself), then these free project instructions are for you! •••marti at scrappy cat has this great idea for displaying her adorable tags. 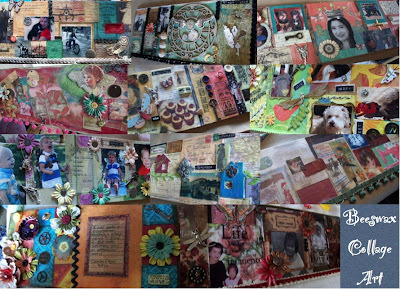 •••a group of 13 very talented scrappers are working on a circle journal - such a great idea! ••• the crafty chica reminded me of a wonderful way to play with wax paper and flowers, i remember making these cards when i was young. •••donna in montana (a fiskateer pal) made an adorable scrapbook out of cardboard coffee cup sleeves...way to upcycle! 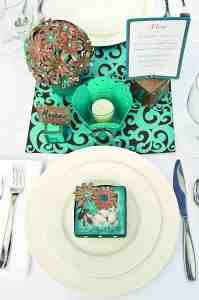 •••casey in arkansas (another fiskateer pal) made these punched ribbon flower cards - such a cute idea! •••i worked with some terrific designers to create these beautiful blog badges - try one on for size! 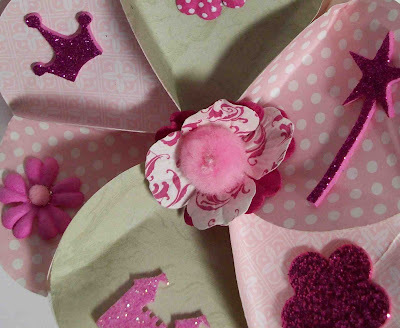 •••i must say, i'm not a huge martha fan, but i really like this tutorial for making paper cherry blossoms. 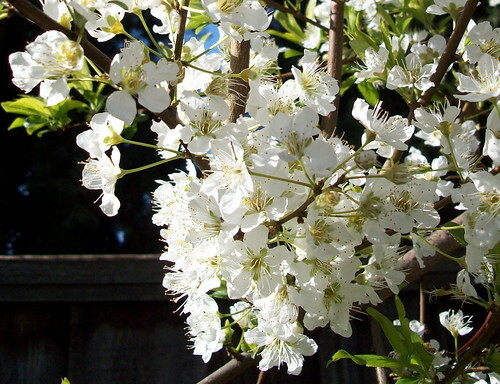 •••while we're on the topic of cherry blossoms, i also like this idea on the diy network for making cherry blossom art. thanks for hoppin' along with me...let me know what you think! i recently joined an atc group on flickr that does weekly challenges. 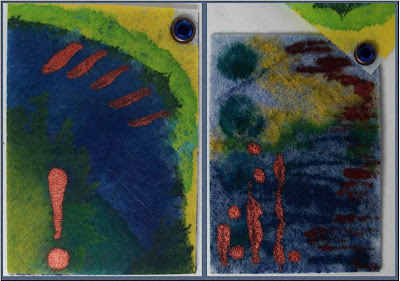 each week, the host provides a work of art and each of us has to interpret the work on an atc. 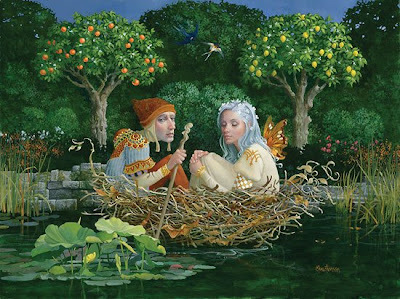 this week, the chosen painting was called "the nest" by james c. christensen. i opted to go abstract with my interpretation. 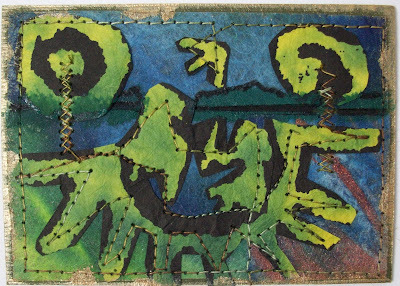 i had this great decorative paper that depicts native american rock art in bright greens and yellows. i collaged it with lutradur that i had painted with acrylic inks, and then i stitched it all down. this card is available for trade! in june, a new book called cupcakes! is coming out—and 3 of my needlefelted projects are featured in it. the purple one on the cover of the book is one of them! 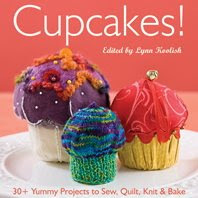 it's an incredibly cute book, with tons of cupcake projects for all kinds of crafters—from paper to sewing to quilting to needlefelting and knitting—and it has recipes too. we had lots of fun in the office frosting and decorating real cupcakes for a photo shoot and video that will be coming out to promote the book. and the last book that one of my board book projects was published in is on special right now, in celebration of national craft month. 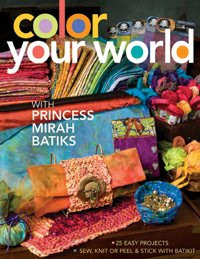 you can get 40% off color your world with princess mirah batiks—just enter promotion code cwpm309 when you order (deadline is 3/31/09). moving away from papercrafts for a moment or two...this is a 6"x6" painting i did yesterday. it's my interpretation of art-deco style painting by e.a. seguy, a parisian artist and textile designer popular in the 1920's. his work is really fun to practice and experiment with...plus some of his works are royalty-free, dover sells them as clip art...below is a picture of the original. i used acrylics on heavyweight linen finish paper. I like the soft body and interference colors, and i also blended some with india inks to get more interesting shades. once i decide on a unique way to mount or frame this, it will be for sale on my website! today is my husband's birthday, so i made him a football themed card. it was perfect timing when the scrappy hours blog asked me to make an inspiration card for this week's challenge which is sports-themed. i am so not into sports, but i pulled up a diagram of a football field and started cutting paper strips for each yard in reds and golds...49er colors. this long skinny size fits perfect in a standard #10 business envelope. head on over to scrappy hours and submit a sports-themed layout or card - there's a great prize drawing too! omg omg omg - i am testing a totally cool "secret" paper for work...what a blast to paint on! i painted a piece that was about 7" x 9" and then i cut it into 4 atc's. i bought these great key and keyhole brads from jen's etsy shop - i met jen through the fiskateers. i used acrylic inks, india inks, acrylic paints, and a spritz of copper glimmer mist after it all dried. i worked with sponges, brushes and eye-droppers to get a really random and unpredictable effect, which i really like! • "keyhold & yarn" is going to italy - look at the atc she is sending me, it's really pretty. • "excited about atc's" was requested by leah, a quilter in texas. what she sends me will be a surprise. • i swapped a "sweet sloth" atc (20 of 20!) with another flickr pal and she sent me this adorable card. • the other 19 of 20 "sweet sloth" cards were traded with the fiskateers for this fab lot! • for my first atc club meeting here in town, i traded 15 "scrabble" atcs for all these - fun! 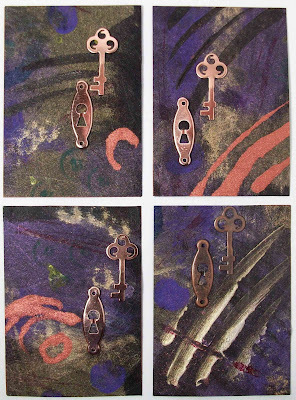 these four "keyhole & streaks" atc's are available for trade....and as i improve my skills, i hope to start selling aceo's! art on a small scale is so great. you get to experiment with new mediums, techniques, colors, textures, surfaces. 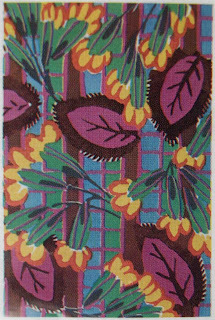 this is two atc's in one...the top layer is a sheet of lutradur, which is attached only by the brad in the upper right corner to the bottom layer, which is timtex. i used acrylic inks and india inks...with no brush. i just painted with the little eyedropper that comes on the cap of the ink jar. i just love how these surfaces absorb the inks and allow them to naturally bleed into each other. this one is available for trade! makes a great surface for atc's. it's 100% polyester, so it takes longer for inks to dry, but it is stiff and has wonderful texture, and it soaks up ink in interesting ways. it's fun to heat stamp--just barely tap your heat tool on it to burn a debossed design. i used acrylic inks, india inks and fabric dye on the background. i glued it to cardstock so i can write on the back. this card is available for trade in about a week, after my co-workers use it as a sample for a sales meeting. let me know if you are interested! 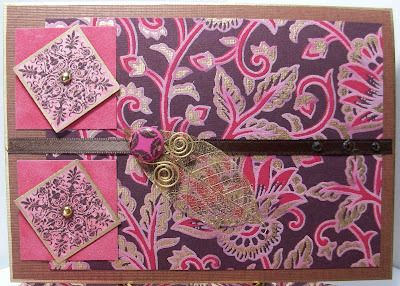 i belong to a cardmaker's group on facebook - once a month the group does a card swap. last month i swapped with a woman in the u.k. and this month i'm swapping with a woman in canada. fun to trade handmade cards across the miles! here is what i made for jenn in canada, it's a design i created last year, i really like trying it with different papers and embellishments. see why you should follow my blog? i like how this card turned out. it's for the winner of my last drawing. a nice design that really lets the paper do the talking....i'll have to make more of these to sell! if you want a chance to win a handmade card, following my blog is easy...you can do it through google or facebook. just click on the gadgets over there to the right. yay! a crafty pal of mine, kiera, was experimenting with those paper ornaments you make with circles, only her first try came out triangular instead of like a sphere. i couldn't bear to toss it, so i pinched the centers together with embroidery floss and embellished it with lots of pink flowers and glitter fairy accents. i added some beads to hang it and it will be a perfect treat for some little pink-loving girl. so i received lots of submissions for this issue - thanks to everyone who contributed. let's start this blog hop with some family fun projects, shall we? • rose also gave me the links to her paper maché recipe and st. patrick's day crafts - great stuff! • if you've always wanted to start a scrapbook, but didn't know where to begin, check out vanessa's basics for beginners post on her blog. • darcy shows you how to make these sweet paper lanterns on smart-bottom enterprises. • i have to give a shout out to the ever-popular crafty chica...she altered a wood lantern with scrapbook paper. 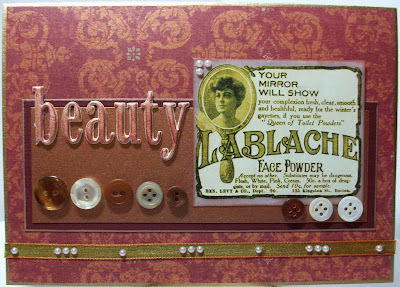 • my pal daniela has the best kits....you're gonna wanna buy this hanging sentiments project! • i love paper beads! cheryl posted a few pics that show how easy and fun it is. i also recommend a book called creative beads from paper and fabric....which is on sale for only $2.99!! • i found this site with the most adorable paper birds - so simple to make too! • while we're on the bird theme....who could resist erika's little paper owls with paper clip legs? 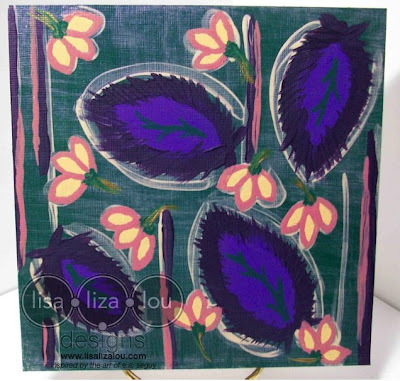 • i can't wait to try Nita's technique for encasing leaves in rice paper for collage - cool! that's a wrap - thanks for hoppin' along with me, hope you found some inspiration along the way! it's the 5th - time to draw a name for the blog follower drawing! i am so thrilled to have 115 lovely people (blogger and facebook gizmos combined) following my blog! using random.org of course, the lucky winner was selected....and it is eileen from kansas! eileen is into cardmaking, photography and crochet...congrats! i haven't designed the card yet, but it will involve these brown, rose and gold yummies shown here! thanks everyone....next drawing is on the 20th! scrappy hours just posted a fun challenge...a day in the life. head over there and submit your card or layout! I combined lots of different things i've been wanting to do on a card in this one. it represents "a day in the life" for me in a couple ways. one is that i'd love each day to be full of sunshine, flowers and song...carefree and idyllic. of course that is cliché and totally unrealistic....but i do my best to capture some of it each day. the other way this card is like "a day in the life" for me is all the different techniques i used, the best day for me is when i discover a new way to create. i recycled an acetate overlay from a valentine's card i received...it already had the white doodly flower on the front. i dripped alcohol inks on the back and let them bleed into each other for a mottled stained glass effect. i figured out how to create words on my cricut, and i made a pinhole border for the first time. 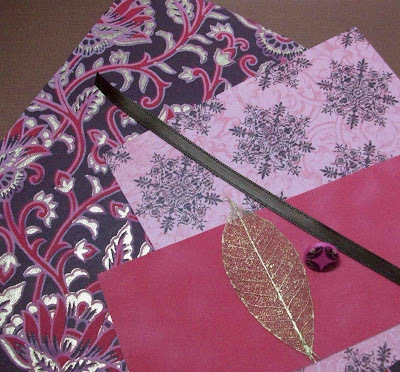 the gold foil behind the floral cut paper is recycled crinkled tissue paper from an xmas gift. so it's kinda busy-looking, but i like it, i think it's cheery! 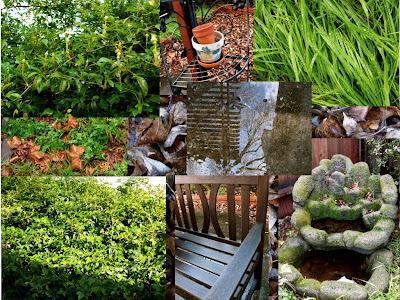 the march challenge was just posted at christmas cards all year 'round....the theme is green with leaves. i used a verse from "i'll be home for christmas" which talks about mistletoe, so i made a little clump of mistletoe leaves with my cricut. i really like the striped crepe paper in the back too...wanted to keep the embellies on this one simple. hope you'll join in the fun! !